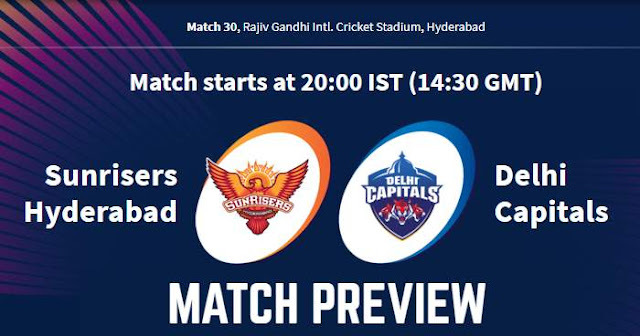 Sunrisers Hyderabad (SRH) will take on Delhi Capitals (DC) in the 30th match of Indian Premier League - IPL 2019 on 14th April 2019 at Rajiv Gandhi International Cricket Stadium, Hyderabad. As far as weather is concerned it will be warm match hours with the temperature around 32° C but dew will be not of that concern here. First two matches of the season, Hyderabad witnessed a batsmen-friendly pitch where high runs were scored with 3 centuries. But the third match was slow wicket with not much for batsmen. There is good news for Sunrisers Hyderabad, Kane Williamson will be returning back to the playing XI which will make Mohammad Nabi back to the bench. Delhi Capitals will like to make changes in their spin department despite winning the last game, Sandeep Lamichhane or Amit Mishra can find the place in playing XI. At Uppal, Hyderabad; Sunrisers Hyderabad and Delhi Capitals have played 4 matches out of which Sunrisers Hyderabad won 3 matches and Delhi Capitals won only 1 match. Uppal, which has already witnessed three centuries in three games this season.